All the decisions of any business should be taken logically. Therefore the importance of admin dashboard templates is high. A dashboard is the magic wand behind every successful website or web application. Because it plays a vital role in tracking key performance indicators, real-time data analysis and useful pieces of information of your business. Moreover, responding and resolving to any issue and communications between admins are made super easy by a dashboard interface. When you ensure the customer satisfaction by responding & resolving issues, profits keep coming as a by-product! Keeping that in mind this list of Responsive HTML5 Bootstrap Admin Dashboard Template is made. We had to go through lots and lots of templates and handpicked the best ones before this list came into life. This post is divided into two sections. As one part is about free templates, the other part features the more elegant, premium templates. If you are more interested to know about the free templates on the list, you can directly jump to the free template list! The user interface and functionality of these templates might vary, but all of the HTML5 Bootstrap Admin Dashboard Template aims at one thing. That is, providing you a fully customizable, manageable admin dashboard template. Some of them use different technologies like AngularJS, Pug.js while others use static HTML along with CSS. Furthermore, the lions share of these templates are built with Twitter Bootstrap version 3 or 4. Hence, all the templates, no matter free or premium, will look stunning on any tablet or mobile device you have. With this in mind, stop searching for dashboard templates. Chose the one suits you best from this list below and start monitoring your website now! There are hundreds of free admin dashboard templates available on the web. Even this list contains some of the best free admin dashboards templates like Gentella and AdminLTE. Still, these are no match for any of the premium category templates. The reason behind is, free templates can only take you to a certain level. From there you need to step into the world of premium category templates. If you intend to get rid of the confinement caused by free products and receive premium supports with regular updates and bug fixes, it is always beneficial to buy premium templates. Not only support and updates, but you get many additional features which are crucial for finishing a high-level web application. Having said that, supreme products always come with a price. As you’re paying your hard earned money, we’ve specially chosen some of the Best HTML5 Bootstrap Admin Dashboard Template for your investment and development. 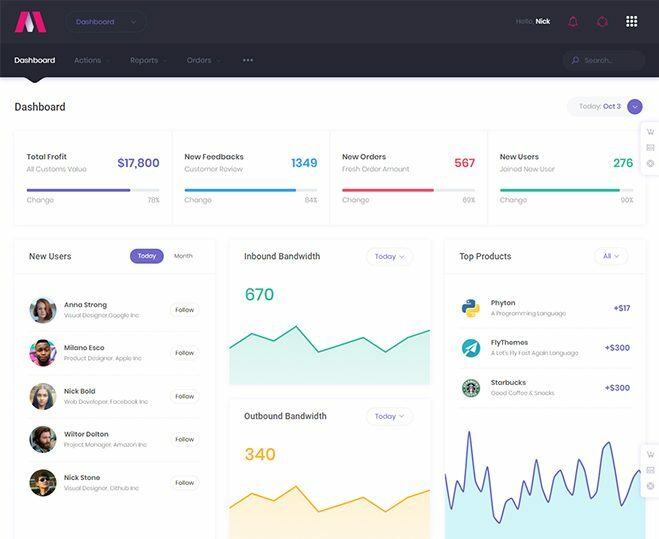 Fuse, a premium HTML5 Bootstrap Admin Dashboard Template from ThemeForest, is equipped with Angular4+, AngularJS and Bootstrap. It uses Google’s Angular Material Project. As a result, all the elements present in Angular Material Project fits right within Fuse. The moment you download Fuse, it has AoT compiler support ready to serve. Furthermore, some necessary built-in apps like Calendar, Mail, Chat, File Manager, To-do, Notes, E-commerce, Contacts are included in this. Last but not the least, some pre-built pages give makes this template truly premium. Regular license of Fuse sells at 25$. With a staggering number of 50,000+ sales and almost flawless rating of 4.89, Metronic sits on the top of the list of Best HTML5 Bootstrap Admin Dashboard Template of Themeforest. Thousands of developers and managers around the globe trust it. Recently integrated Bootstrap 4 and Angular 4 support, SASS Support, Unlimited Demos and Custom Data tables take this template to a whole another level. Moreover, nicely crafted 3rd Party plugins are fully ensured to match Metronic’s functionality and make the design more attractive and optimized. This super template has 8 Different Themes, countless (1500+) UI features, full support for material design layouts and RTL support. All these characteristics make Metronic a Template to get! It has a price tag of 30$. The new Bootstrap 4, SASS, jQuery powered multiple layout HTML5 Bootstrap Admin Dashboard Template Pages helps you to build your web UI and dashboard in a really effortless and straightforward way. It has numerous customizable features, demo pages and full RTL support. Yet this template is surprisingly light-weight. Additionally, you can choose from 6 available color themes. To start building you get 5 useful dashboard layouts. If you decide to use this template you have to buy it for 24$. Admin Press is a flat, customizable, premium, HTML5 Bootstrap Admin Dashboard Template built over latest Twitter Bootstrap 4.0 framework. Other technical aspects are HTML5, CSS3 and media query. This freshly released template has possible use as all types of backend web applications. Be that, custom admin panel, app backend, CMS or CRM. Additionally, angular CLI starter kit is provided with this template to quick start your project in the angular CLI template. It’s various options of dashboards, demos and color schemes help you to create your back-end admin panel easily. When we are preparing this post, the template is only a month old but already has a considerable amount of sales and rating at 30$. 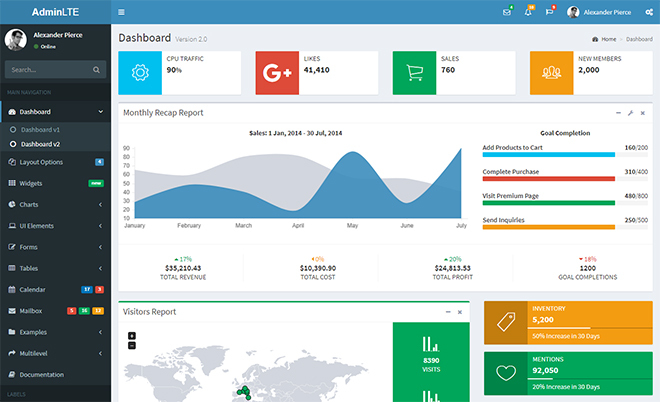 Another powerful, Bootstrap 4, professional HTML5 Bootstrap Admin Dashboard Template is The Admin. It’s huge library and premium quality UI/UX components are ready for your next project. It is crafted so beautifully that no matter what your project is, from eCommerce websites, CMS backends, CRM to SAAS, web applications, support & social portals, personal business or corporate websites, it suits just perfect. It’s clean and user-friendly design, well-structured and commented codes speed up your work. Finally, created with cutting-edge technology “The Admin” is a multi-purpose template with further usages as well. This template’s price starts from 24$. Wrap Bootstrap distributes some stunning templates. Sign App is an excellent HTML5 Bootstrap Admin Dashboard Template available there. 3000+ purchase backs up its excellence. It has pixel perfect stylish design along with tons of programming features. This template makes the maintenance of your website or web application as easy as pie! To add, seven versions of this template are available which includes latest Bootstrap 4 and Angular 4.0 versions. Lastly, it’s full responsiveness, super smooth & fast page loading and a beautiful auto-hide sidebar guarantees its place into this list. You can purchase this template for 31$ only. 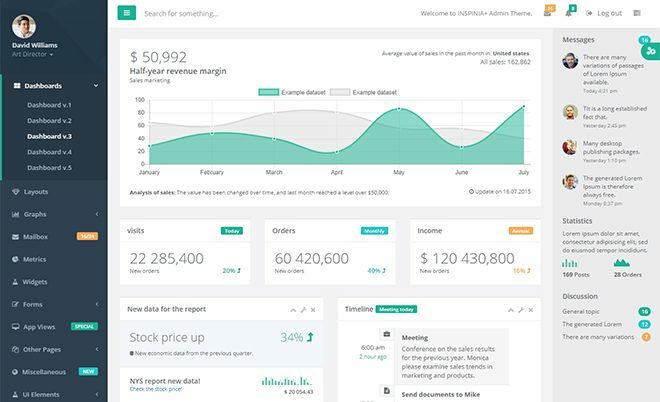 Another eye-catchy, cool, attractive custom built admin theme available at Wrap Bootstrap is known as Minton. This is a fully featured administration template built over the awesomeness of Bootstrap 4.0, HTML5, jQuery and CSS3. In the first place, different layouts (Including Dark, Light & Boxed) and menu styles, Material Design, RTL and SCSS support are some of its modern features. The theme has cross-browser functionality thus supports every browser and device. To add with, easy to understand codes and easily customizable facility hands you the power to create websites or applications just as you want. Lastly, it’s 2500+ font icons, more than 100+ pages and 5+ colors schemes provide a beautiful look as well. Interestingly, this HTML5 Bootstrap Admin Dashboard Template contains a free landing page. So, if you have any new product to launch you can always make use of that by customizing. 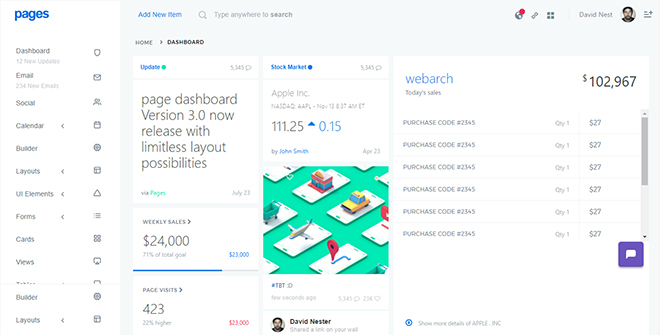 It has a reasonable price of 18$ if you decide to build your admin dashboard with Minton. Inspinia is a fully responsive, one of the Best HTML5 Bootstrap Admin Dashboard Template powered with the flat design concept. It’s built over modern technologies like Bootstrap, HTML5, CSS3 and Media Query. Furthermore, it has six different versions to chose from. Each one is developed for different functionality. For example, the static HTML/CSS/JS file version is perfect for any programming language application. On the contrary, AngunalrJS version supports angular Framework. The sad thing is, Inspinia doesn’t support Angular 2 or 4. In conclusion, it has possibilities as any back-end admin dashboard or project management system. A single license of Inspinia is costs 36$. 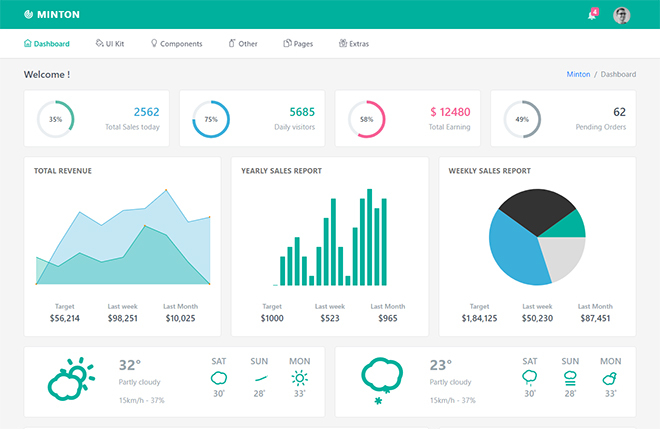 Another beautiful, lightweight yet powerful dashboard template available at Wrap Bootstrap is Super Admin. This retina ready admin template is based on Bootstrap 3 and comes with 14 different skins and over 25 fully customized jQuery plugins. It’s beautiful animations, background images, color choices and left aligned on-hover menu gives the whole template an aesthetic look. Meanwhile, different media components like HTML5 Audio/Video player, Lightbox, Carousel help to grasp better multimedia experiences. Interestingly, this template comes with a surprise gift. A front end template Unukue is given free of cost if you Buy Super Admin at 14$ only! Material Dashboard PRO, a premium HTML5 Bootstrap Admin Dashboard Template is Google Material Design inspired. It contains every features and elements you need. The premium version was released upon people’s reviews who have already used the free demo version. As a result, the paid version is straightforward to use but contains every necessary tool needed to build a complex site. This powerful template helps you create any CRM, CMS or admin panels easily. Along with Twitter Bootstrap, this template uses another custom web framework known as Bootstrap Material Design. It is the backbone behind all the beautiful animations, transitions, ripples or material effects of the template. Selling price of this template is 49$. 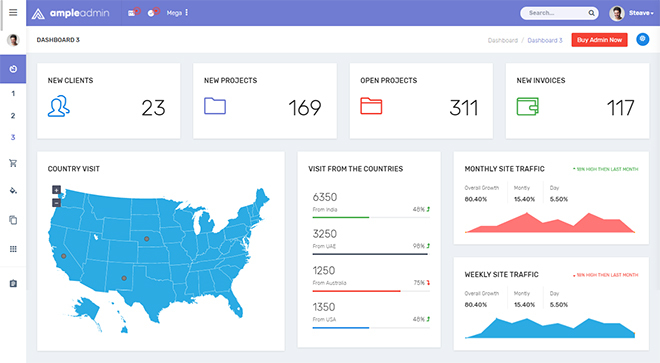 Ample Admin is a responsive HTML5 and CSS framework template based on Bootstrap 3.3.7. 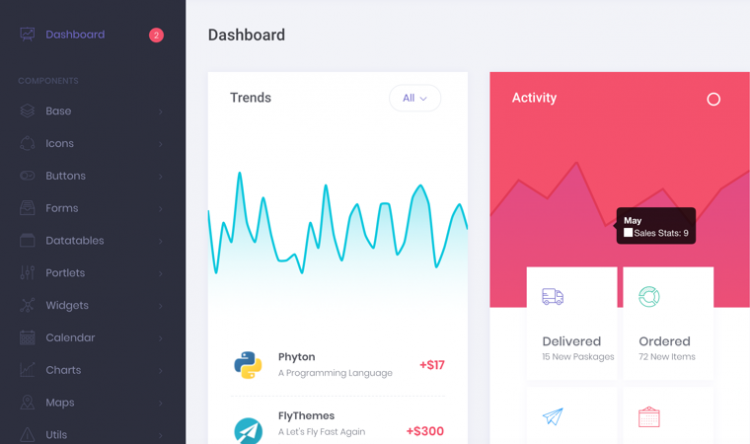 This popular WebApp template can be used for designing and re-designing any back-end admin dashboard or control panels. As Ample admin is built upon modular design, it’s customization requires minimal efforts. Moreover, a valid and handy documentation shows you each and every possible way towards your destination of creating a new administrative website. Not to mention, it’s 3 different dashboard styles, 7 different demos and 6 skin colors provide elements to its elegant look. 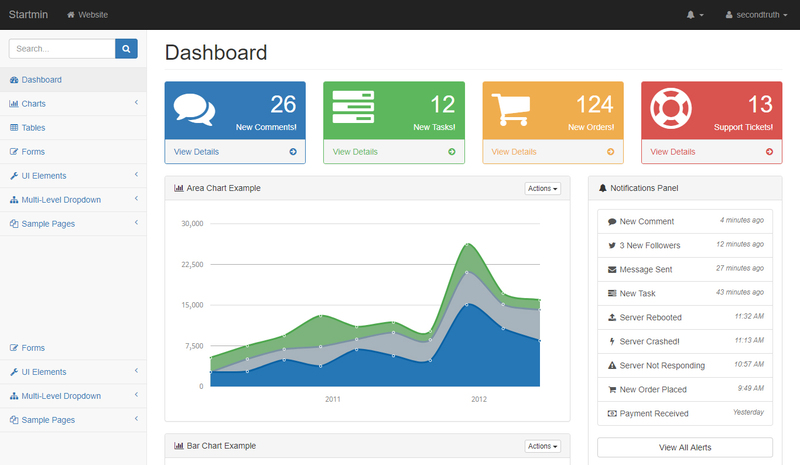 This HTML5 Bootstrap Admin Dashboard Template is available for purchase at WrapPixel from 24$. Gentella is a flat, beautifully crafted, SEO optimized, Bootstrap 3 built, super smooth free HTML5 admin panel template. This is amongst the most downloaded admin dashboard templates form Themewagon. As thousands of web application developers, programmers, back-end developers use this brilliant template, you can also utilize this for building your admin panel. Though premium templates are superior, if any free template can compete with their big brothers, Gentella would be the one! 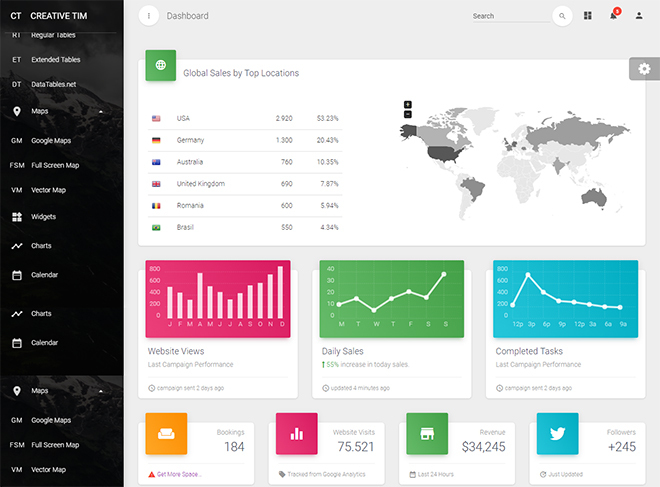 Another beautiful HTML5 Bootstrap Admin Dashboard Template is AdminLTE. Currently, a numerous number of back-end and admin panel interfaces are supported by this cool open source admin UI kit. Lots of reusable and re-designable components, responsive interface along with other important features make AdminLTE special. It reduces effort and helps to complete your project efficiently. Nevertheless, this template is completely free for you to use. 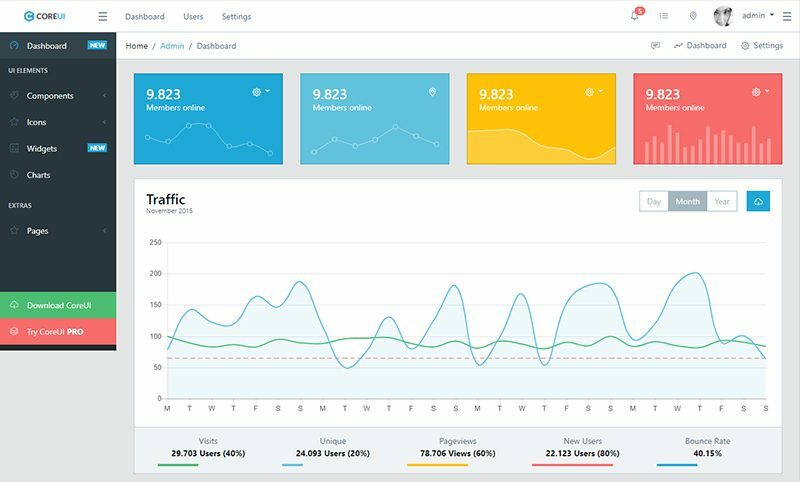 Star admin is a lightweight, simple, easy to use, free admin dashboard template available in Themewagon. The best thing about this template is, brand new Bootstrap 4 framework is used in its development. If you are searching for a background admin dashboard template to get a better grasp of your website & you also demand a pretty interface for your background admin panel, Star Admin is for you. 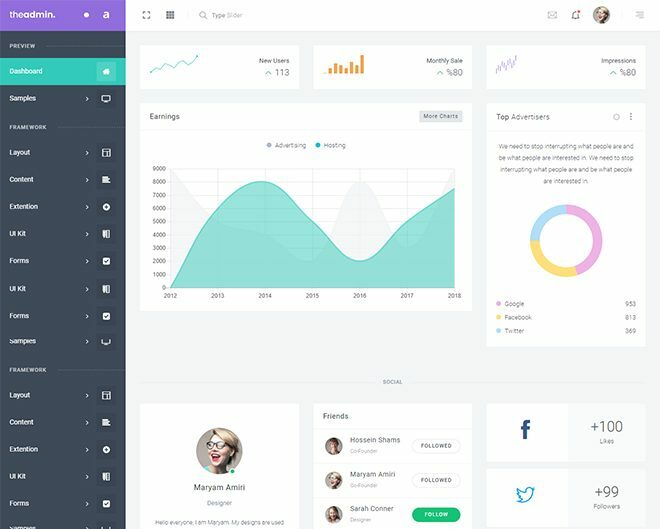 Moreover, it’s stylish UI, beautiful jQuery Effects and typography makes this one of the Best HTML5 Bootstrap Admin Dashboard Template free to download. Another free responsive template among other Best HTML5 Bootstrap Admin Dashboard Template is Paper Dashboard. A combination of excellent colors and elegant typography gives this template life. 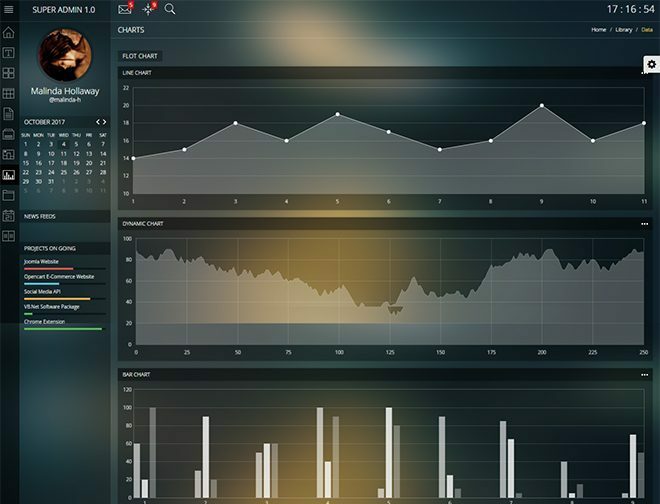 Besides, it’s spacious cards and graphics, available charts and graphs give you the power to customize your dashboard as much as you like. In contrast, it’s user experience is really light and simple! 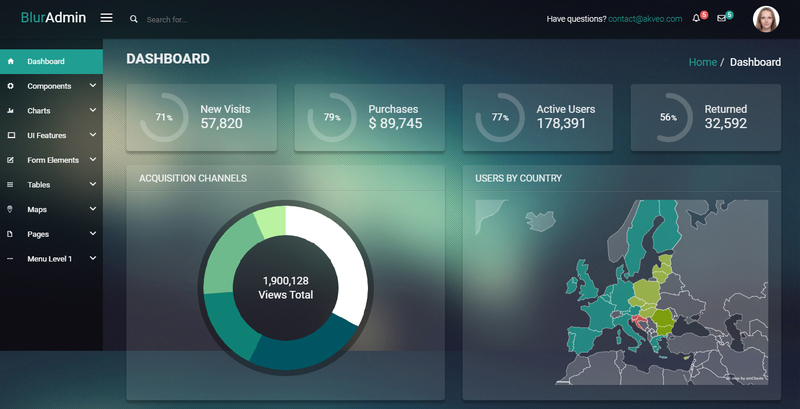 Light Bootstrap Dashboard is another fine creation by Creative Tim. It is a simple, flat and attractive template. As it is built with Bootstrap 3, this template is fully supported on almost every modern browser. When it comes to creating apps and other necessary backgrounds, an enormous collection of elements of this theme generate multiple possibilities. Moreover, it’s not like other admin dashboard templates. It has possible extent as CMS or CRM, project management systems or web applications backend. When you download this free admin dashboard Template, 6 color filters for sidebar come built-in. The latest version of Bootstrap is Bootstrap 4. 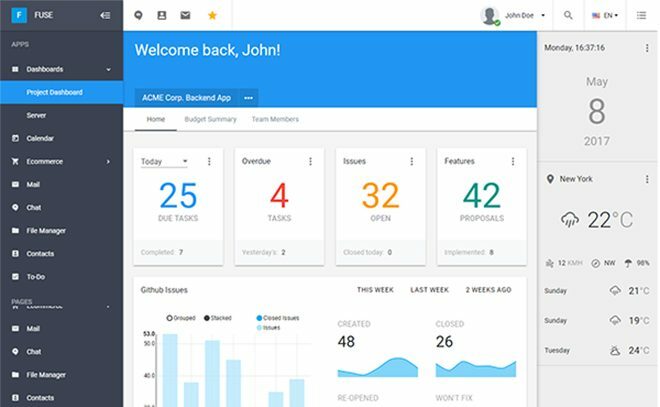 CoreUI is a Bootstrap 4 based admin template as well as it’s free for you to use. It is empowered with modern technologies like Bootstrap 4, SASS, Bower and Gulp. Still, the template is incredibly light and ready to deliver ultimate user experience. Latest Bootstrap ensures the best responsiveness possible from a desktop or laptop to handheld mobile devices. In addition, CoreUI offers 6 versions naming HTML5, React.js, Vue.js, AJAX, AngularJS and Angular 2. You need to click here to download this cool open source Bootstrap Admin template. Remember the 10th template of our list? 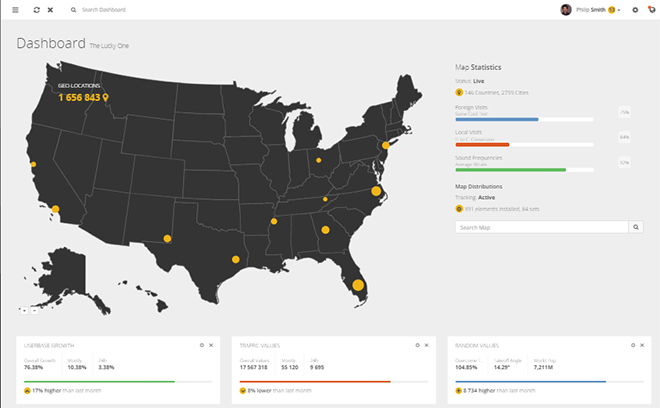 Google Material Design inspired template Material dashboard PRO? It turns out, there is a lightweight and free version of that available too! Taking the necessary features from Google’s Material Design, this free Material Bootstrap Admin template Material Deashboard was designed. It consists of a beautiful set of components and also easy to use. Moreover, Material Dashboard was designed using famous framework Bootstrap thus it looks great from any device. Nevertheless, a couple of third-party plugins come built-in with this template. These plugins are redesigned to get a better functionality with the rest elements. 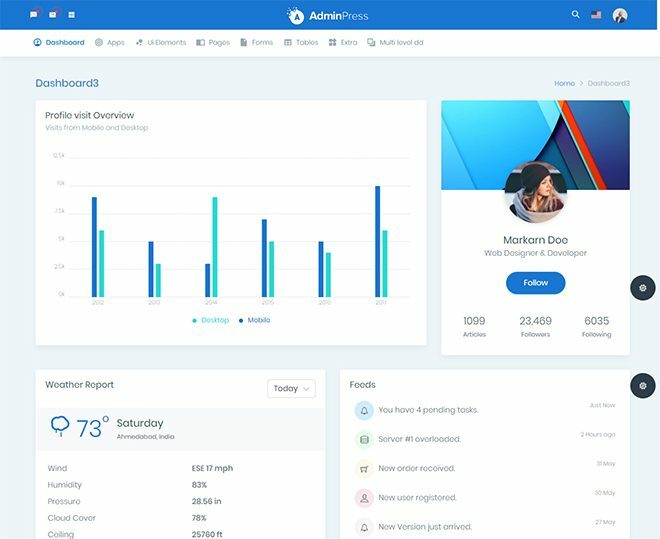 So, Material Dashboard falls into the category of very powerful Bootstrap admin dashboard templates, allowing you to build admin panels, content management systems and CRMs with minimal effort. Material Design is one of the Best HTML5 Bootstrap Admin Dashboard Template built upon the request of the users. Publisher Güray Yarar created this free Bootstrap admin template from the inspiration of Google’s material design. As a result, this template contains all the material effects, animations and transitions from there. Material concepts are introduced in an easy to use way here, along with a set of components. The beautifully crafted depth and order of the pages, easy to follow navigation system and gorgeous looks makes this a successful and one of the Best HTML5 Bootstrap Admin Dashboard Template. Startmin is a free HTML5 Bootstrap Admin Dashboard Template build over Twitter Bootstrap framework. Some of its cool features include FontAwesome icons, sortable data tables, social media icons, charts, dashboard information widgets, etc. It is an open source admin dashboard template. Initially, it was developed by start Bootstrap, now it’s fully free to download and use. Wrappixel presents a minimal, metro designed, free admin template Matrix Admin Lite. This admin template is easy to use, clean, polished, reliable and resourceful. Moreover, you can customize and expand the template very easily, that even, at a quite fast rate! This template contains 20+ quality plugins, useful widgets and shortcodes. Not to mention, it also includes different charts and graphs, making this template equipped with fantastic analytical features. Hurray! You’re here!! 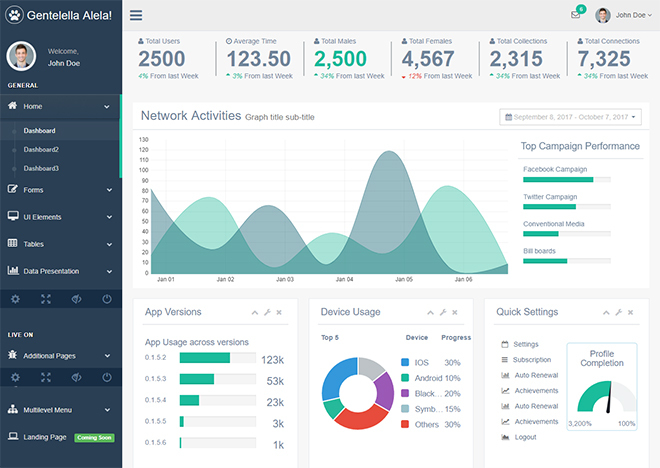 This ends our list of Best HTML5 Bootstrap Admin Dashboard Template, both free and premium. So, was this post helpful? Have you decided yet which one you’re gonna use for your development purpose? Are you gonna jump into the premium level directly? Or you want to play safe and try the free ones first? Furthermore, do you have any suggestions that can make this list better? Never hesitate to let us know! Nevertheless, wish you a very happy creating!